For more race photos visit LefrakPhotography.com. Skiers and snowboarders took to the slopes around Lake Tahoe last weekend for skiing and snowboarding competitions across the area. 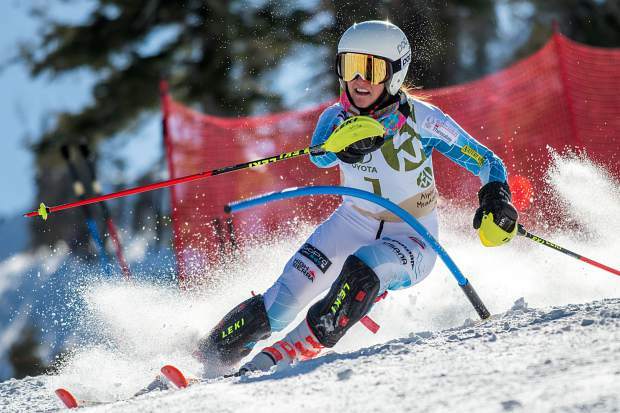 Over at Alpine Meadows, the Far West Skiing U16+ slalom qualifiers were held and brought together more than 200 competitors for two days of racing on Jan. 27-28. On the boys’ side, Squaw Valley Ski Team member Jordan Cashman captured first place by more than two seconds with the day’s two fastest runs. He’d finish his two runs with a total time of 1 minute, 23.07 seconds. Mammoth skier Alex Colby was second with a total time of 1:25.29, followed by teammate Winston Pretti in third place with a total time of 1:26.53. On the girls’ side, Squaw Valley skiers put together a solid day with four of the fastest total times. Alix Wilkinson led the group with a total time of 1:28.53, finishing more than three seconds faster than teammate Magnolia Neu. Sugar Bowl’s Tea Kiesle was next with a total time of 1:33.38. Squaw’s Jillian Ferre (1:33.49) and Aliza Neu (1:34.35) rounded out the top five skiers. Racing continued the following day at Alpine under bright blue skies, and Mammoth’s Colby improved on his first day’s performance, to capture the overall win with a total time of 1:18.63. Sugar Bowl’s Preston O’Brien was second with a time of 1:19.76, followed by teammates Jack Schaffner with a total time of 1:20.66, and Dylan Thomas with a total time of 1:20.98. Diamond Peak’s Matthew Smallhouse rounded out the top five with a time of 1:22.19. In girls’ racing, Ferre picked up the win on Sunday, edging teammate Magnolia Neu by 0.28 seconds with a total time of 1:28.59. Sugar Bowl’s Georgie Sullivan was third with a total time of 1:30.67. Eliza Neu (1:30.77) and Squaw’s Maya Wong (1:31.21) gave Squaw Valley’s team four skiers in the top five for the second day in a row. Northstar California Resort was also host to Far West Skiing with the U14 slalom qualifiers taking place on Saturday, Jan. 27. The Squaw Valley girls put together a dominant performance on Loggers Loop trail with six of the seven fastest total times of the morning. Amber Hansford led the way with a total time of 1:17.75 for first place. Teammate Allison Mollin was next with a total time of 1:17.87, followed by Squaw skier Kacey Benjaminson with a combined time of 1:18.03 for third place. Sugar Bowl’s Ella Costello broke up the streak of Squaw racers with a total time of 1:19.95 for fourth place. Ella Hartmanis (1:20.27), Olivia Flight (1:20.58), and Haley Flaherty (1:20.63) were the next three fastest for Squaw. Zack Staudenmayer picked up the win on the boy’s side with a total time of 1:18.68 to give the Sugar Bowl skier a first-place finish. Squaw’s Karsten Hart was next with a total time of 1:19.15, followed by Mammoth’s Mitchell Parsons in third with a combined time of 1:21.53. Racing continued the following day at Northstar where the Squaw girls posted the days four fastest combined times. Benjaminson led the way with a time of 1:16.53, followed by Carly Hamilton (1:17.96), Hartmanis (1:19.44), and Cayla Cushard (1:20.10). Sugar Bowl’s Maddie Welling (1:20.45) rounded out the top five skiers. The boys’ race would again be won by Staudenmayer with a time of 1:07.70. Squaw’s Hart was second with a total time of 1:08.62, followed by teammates Emmett Roberts (1:08.88), Marc Durant-Bender (1:08.97), Marco Brougher (1:09.20), and Etienne Dollar (1:10.14). 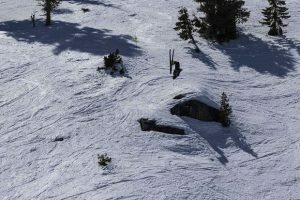 Boreal Mountain Resort played host to the United States of America Snowboard and Freeski Association North Tahoe Series’ first round of slopestyle. The competition was held on Sunday, Jan. 28, and attracted roughly 80 competitors to Boreal. The 10- and 11-year-old boys’ snowboard division boasted the largest field with 10 riders competing. Brooklyn DePriest, of Rocklin, Calif., added to his haul of rail jam trophies with a first-place finish in slopestyle. DePriest put together the day’s best tricks on the rails, and also carded the judges’ highest score on the jumps for a total score of 1,100. Truckee’s Tanner Kuch was second with 990 points, followed by Chester, Calif., rider Adam Laboda with 880 points. In 14- and 15-year-old boys’ snowboarding, Reno’s Cole Sorensen picked up the win with the day’s highest score on both the rails and jumps to finish with 1,060 points. Dante Schipani, of Truckee, was second with 950 points, followed by fellow Truckee rider Sebastian Hall with 840 points. Other winners in boys’ snowboarding included: Noah Brown, of San Fransisco, in the 12-13 division; Taitten Cowan, of Pacifica, Calif., in the 8-9 division; Cole Valles, of Reno, in the 16-17 division; and Mathew Laboda, of Chester, Calif., in the 7-and-under class. On the girls’ side, Truckee’s Morgan Just captured first place behind the highest score on jumps to finish with a total score of 1,030. 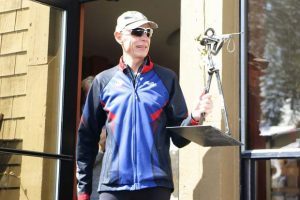 Other winners included: Kaitlyn Bland, of South Lake Tahoe, in the women’s 23-29 division; Ashley Parisi, of Truckee, in the open class; Viviam Oram, of Berkeley, Calif., in the 10-11 division; Amelie Haskell, of Larkspur, Calif., in the 8-9 class; and Ella Sorensen, of Reno, in the 12-13 division. Freeskiing slopestyle was also contested during the day. Elliot Irving, of Oakland, Calif., took home first in the deepest field of competitors with a total score of 1,050 to win the boys’ 16- and 17-year-old division. 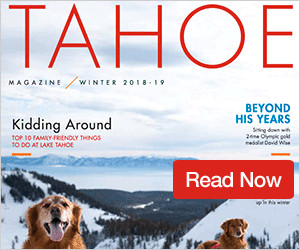 Also topping the loaded field of skiers were Joey Elliss, of Thredbo, Austria, with a total score of 1,050 to win the 10- and 11-year-old boys’ division, and Truckee’s Noah Rodarte with 1,050 points to take first in the boys’ 14- and 15-year-old class. 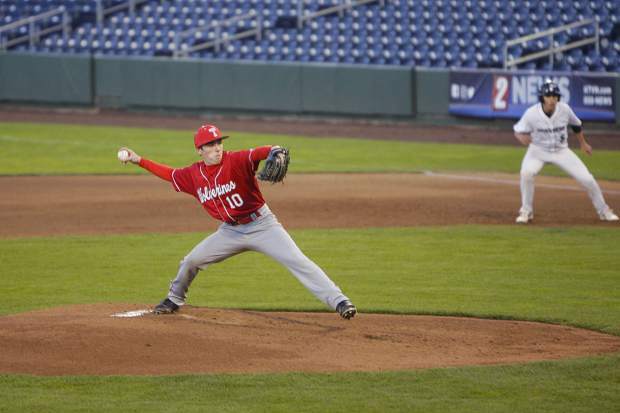 Other winners included: Sawyer Coll, of Truckee, in the 12-13 class; Mack Winterberger, of Truckee, in the 8-9 division; Zachary Poulin, of Truckee, in the open class; and Will Hasselman, of Mountain View, Calif., in the 7-and-under division. On the girls’ side, Truckee’s Marea Adams picked up first place in the 14- and 15-year-old division with 1,020 points. Other winners were Clements Evans, of San Francisco, in the 16-17 division, and Elis Paquier, of Saratoga, Calif., in the 10-11 division.